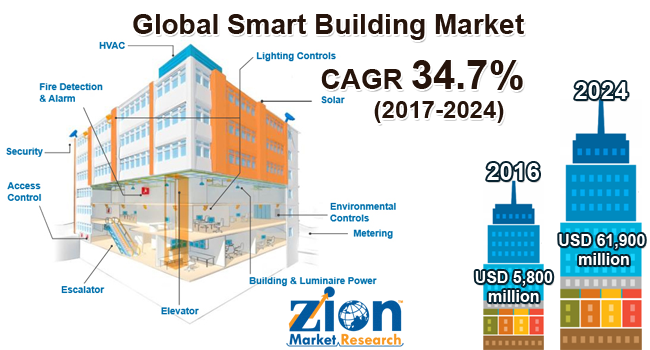 Global smart building market expected to reach USD 61,900 million by 2024, growing at a CAGR of more than 34% between 2017 and 2024. The report covers the forecast and analysis for the smart building market on a global and regional level. Future market opportunities and detailed information about the market are discussed. The smart building market has been analyzed using Porter’s Five Forces Analysis. The market is segmented on the basis of automation type, service, and application which in turn is bifurcated on a regional level as well. The report deals with the in-depth quantitative and qualitative analyses of the smart building market. A smart building is any type of infrastructure that makes use of automation in order to control the operations of the building which can be anything such as ventilation, lighting, heating, air conditioning, security, and much more. To do all this actuators, sensors, and microchips are used within the building to collect the data and accordingly manage the services and functions. Such type of infrastructures help the operators, owners, and facility managers to enhance the asset performance and reliability, which leads to space optimization, minimizes the energy utilization, and reduces the environmental impact of buildings. The major factor driving the growth of smart building market is the globally increasing concerns about the energy consumption. The utilization of energy is increasing at a rapid rate thus making it necessary to find efficient ways to utilize it wisely. Since there has been an increase in the number of commercial complexes that consumes a significant amount of electricity and other types of energy the requirement for the automation systems has increased. Intelligent security systems are most widely used automation type in smart buildings. Intelligent security management system results in much lower operational costs and increased energy savings through automated energy conservation features. Rising security concerns and the latest technological advancement and reliability that is provided by the intelligent security systems is increasing its demand in the global market. Professional services segment contributed more than 50% of the market share in 2016. The professional services segment is expected to retain its dominance in the forecast period. Professional services offer consultation and training activities by understanding the organization requirements, technical goals, and the challenges. Thus it helps the organizations to find effective ways to resolve their challenges. Commercial buildings include office buildings, retail infrastructures such as malls, shopping stores, and others. All these buildings have huge utilization of energy and require high-tech security systems thus commercial buildings have increased utilization of the automated systems. The commercial buildings segment accounted for the largest share in 2016 and is expected to retain its dominance throughout the forecast period. The commercial building segment is anticipated to register CAGR of approximately 34% during the forecast period. Increasing energy-saving concern in order to reduce the operational cost will drive the growth of this segment. Europe holds the dominant position in the smart building market followed by North America and Asia Pacific. The factors that are driving the market in Europe are high adoption rate of the technological advancements and improved and favorable government initiatives to build smart and intelligent structures. It is anticipated that Asia Pacific will grow with the highest CAGR of approximately 35% between 2017 and 2024. The factors that are positively affecting the growth of the market in Asia Pacific are increasing disposable income, growing commercial infrastructures, and rising adoption of advanced automated technologies, especially in the developing regions. The report includes detailed profiles of the prominent market players that are trending in the market. The list of the players that are compiled in the report is Siemens AG, ABB Group, Cisco Systems, Schneider SE, United Technologies Corporation, Buildingiq, Inc., Honeywell International, IBM Corporation, Johnson controls, and Delta Controls, among others. The prominent market players maintain the competitive edge in the global market by making investments in the mergers and acquisitions and by increasing their product portfolio. In October 2017, Schneider Electric had launched EcoStruxure Building, a new platform designed to support the management of smart buildings.